One of the best ways to get your dog to take ESSIAC for Pets and TRU-PINE for pets is to use is the tasteful GREENIES® PILL POCKETS® Treats. 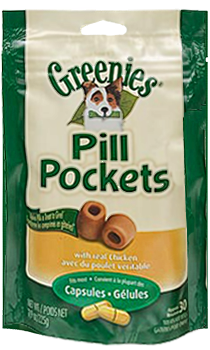 These pill pockets have built-in pouches to easily hide pills and ensure your dog takes their supplements. These all-natural treats are a healthier alternative to using human foods, because they have fewer calories and less fat and sodium. Make pill-giving more enjoyable for both you and your dog. This healthy and delicious treat masks the taste and smell of supplements making pill-giving a reliable, stress-free experience. Rehydrated chicken, glycerin, wheat flour, vegetable oil, wheat gluten, dried corn syrup, dried cultured skim milk, natural flavors, sodium bisulfate, natural chicken bouillon flavor, hickory smoke flavor, xanthan gum, preserved with mixed tocopherols.